Deliveroo, the leading on-demand food delivery platform, operates in over 200 cities globally. After launching Deliveroo Hong Kong in late 2015, General Manager Brian Lo has rapidly grown the business across the island, Kowloon and New Territories, employing hundreds of riders and partnering with over 2,500 restaurants in the city. Join us for a fireside chat with Brian as we learn about the opportunities and challenges inherent in tailoring a global business model to the Hong Kong market. Well known for his down-to-earth yet creative management style, Brian makes it a point to regularly deliver meals and pick up customer service calls himself in order to remain fully rooted in day-to-day company operations. His approach is certainly part of Deliveroo's recipe for success: since entering the Hong Kong market, the company has maintained month-on-month double-digit growth. Brian will share his thoughts on the future of food delivery businesses in Hong Kong, the use of technology and data to analyse consumer behaviour, and how to cultivate a dynamic company culture. We’ll also hear about his role in Deliveroo Hong Kong’s incredible creative growth and influence in the delivery space — combining online and “offline” platforms, launching the first delivery-only kitchen concept in HK, and how application of behaviour trend data has facilitated the expansion and launch of virtual brands. Bites/snacks will be generously provided by Deliveroo. Optional cash bar available. Please note that this event may be recorded. Brian Lo, a Hong Kong native, is the General Manager of Deliveroo Hong Kong, the leading on-demand food delivery platform founded in London in 2013. 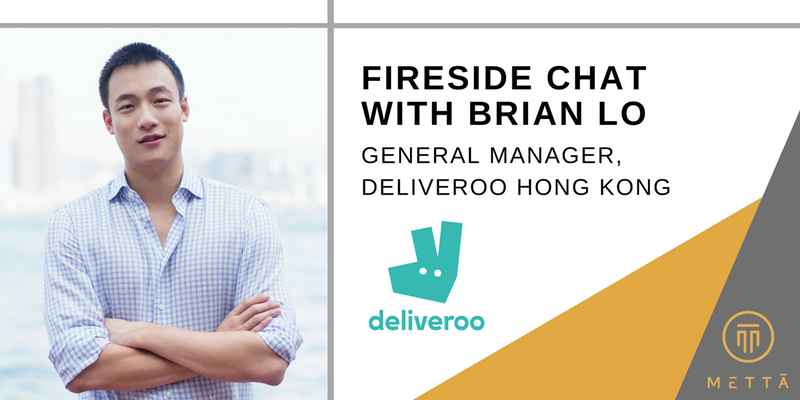 Brian launched Deliveroo Hong Kong in late 2015, and as General Manager, Brian is responsible for everything from operations to staff development to maintaining relationships with clients and customers. Prior to joining Deliveroo, Brian was an Engagement Manager at McKinsey & Company where he specialised in working with large corporations around the globe to improve their overall capabilities and performance. Brian graduated from The Wharton School at the University of Pennsylvania with a degree in economics, finance and management. He is fluent in English, Mandarin and Cantonese. Deliveroo is an award-winning delivery service founded in 2013 by William Shu and Greg Orlowski. Headquartered in London, with more than 800 employees in offices around the globe,Deliveroo works with over 30,000 best-loved restaurants as well as over 30,000 riders worldwide to provide the best food delivery experience in the world.